Tales from Paradise Heights is a collection of plays set in a rough, tough council estate, exploring the challenges and dangers for the people who live there. In Frank Morgan, itâ€™s as bad as it gets as a villain, in the truest sense of the word he tells his own story. Frank is a hard, bad man of today but his sentiments are timeless; Al Capone went to prison saying â€˜this is what I get for giving people a good time!â€™ and the Kray Twins thought the same thing, seeing themselves as benefactors. Frank Morgan is unrepentant and even proud of his litany of violence, fear and extortion but behind all his self-justifications, some interesting questions are raised. The setting for the play is ideal; a grubby, run-down club, appropriately called â€˜The Ace of Spadesâ€™ (the death card). Right at the start, Frank opens his coat to reveal a blood-soaked shirt as he ominously pulls a hammer out of a pocket and places it on a table. This is a particular hard world, which so many of us are thankfully never forced to confront but which for many others is everyday life. Having put his cards on the table, interspersed with drinking from a bottle, we see a very credible character unfold. Perhaps annoyingly, he has a certain charisma and clearly has thought a lot about his own world, suggesting the people like himself are the result of an over-stretched police force in areas the rest of society does not want to know about. Frank goes further to stress that without his sort creating a kind of order, there would be complete anarchy. If you donâ€™t agree with Frankâ€™s solutions, as surely very few would, you are left pondering would you, given the chance, resolve the issues in the countryâ€™s most deprived areas. 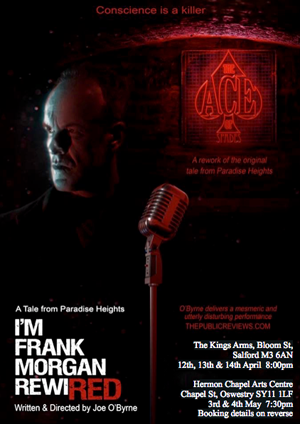 Iâ€™m Frank Morgan Rewired is an updated version of a play first performed in 1999, and writer Joe Oâ€™Byrne has adapted the script to take account of current issues. This is a real tour-de-force, with Joe on stage for over two hours as he takes us through the inner workings of Frank Morganâ€™s world. It is a full ranging performance, showing Frank in his most aggressive and funniest moods, and there are precious few vestiges of any hope in his world, short of only the hardest and nastier controlling the roost. There is a surprising amount of action for what is a one-man show, where the mood is taken up and down as we learn various aspect of both Frankâ€™s character and his world. It is a consistently engaging performance, aided by a wide range of sound effects and both music and voice samples. At times, there is an eerie silence as Frank drops his voice when he is at his most menacing and dark. It is not always an easy play to watch or experience but then it was never mean to be. A dark and compelling pieces of theatre, punctuated by sharp, acidic humour, Iâ€™m Frank Morgan Rewired will have you pondering the man and his world long after seeing the show; a fine and well-observed performance and intricate observation of a very dark world-view of life.